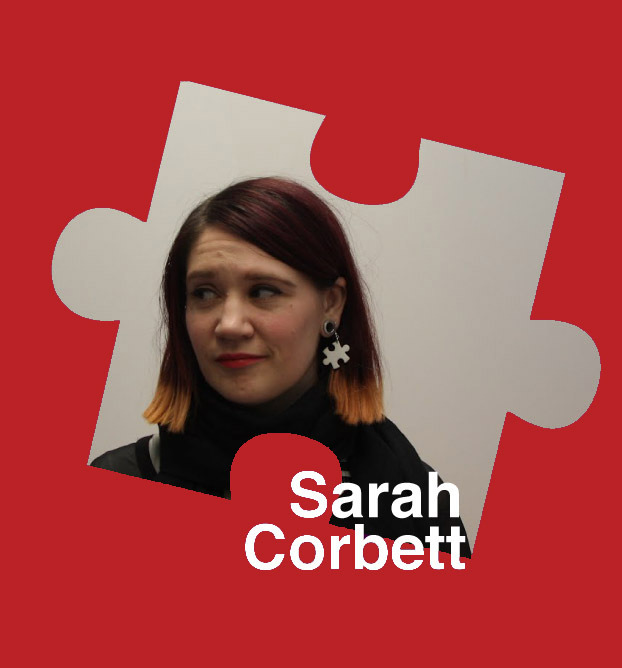 Hmmm.. what do we say about our own Sarah Corbett? Well she is in this blogpost supporting us all and our three craftSTARS (Mr X Stitch, Deadly Knitshade & Hilary from CraftBlog UK) to take part in this new project Craftivist Jigsaw. She is a leading spokesperson on craftivism and runs the Craftivist Collective with members and groups across the world delivering their projects as well as being inspired to do their own. She works with charities as well as creative institutions such as Tate, Hayward and Tatty Devine to engage people in activism through reflective craft methods. She used to work for Oxfam as a campaigner so is an experienced (and crafty) activist. What do you do now that you are a full-time Craftivist (livin’ your dream!) I run the nuts and bolts of the Craftivist Collective and do my own crafty activism too for myself and sometimes as commissions. I deliver craftivism talks, workshops, exhibitions and random projects with organisations too (plus temp when I need rent money so I don’t have to say yes to craftivism requests I don’t believe in). Why do you love craft? It calms me down when I get stressed or anxious plus it’s a way to express my creativity in my tiny flat or on long journeys. I also love the craft community I feel part of and the lovely reactions I get from the public when I’m crafting. Craft really can bring out beautiful and thoughtful conversations with strangers. How did you get into crafting? By accident. I was never taught it at school. When I moved to London my flat was too small to paint in and I was travelling a lot with work plus my job was very erratic and demanding. I found cross stitch as an outlet I could do anywhere and I loved the grid system (I’m a little OCD maybe) and feeling of being able to achieve something beautiful as a gift for people. Then I started thinking about how to link craft with activism and never looked back! Talk about your favourite piece of your own work. I handembroidered this handkerchief for my MP. I was given the hanky by an old lady at my church but I use my dads old hanky so didn’t need it. It the same time I was struggling to get to know and engage my local MP on global issues- she kept ignoring me and being quite defensive and cold so I came up with the idea of making her a hanky to give to her to engage in a dialogue with her about injustice in a positive and encouraging way- asking her to use her power and influence for good and not blow her chance of doing the right thing (get it?!;p) . 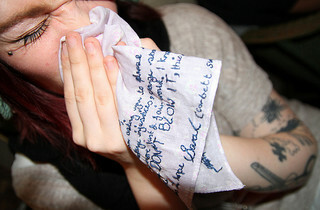 It worked and even though we often disagree, I think the hanky helped break the ice and strengthen our relationship. Can you recommend someone who is doing craft work you admire and explain why? I love the work that Fine Cell Work do with prisoners & ex-prisoners in the UK. 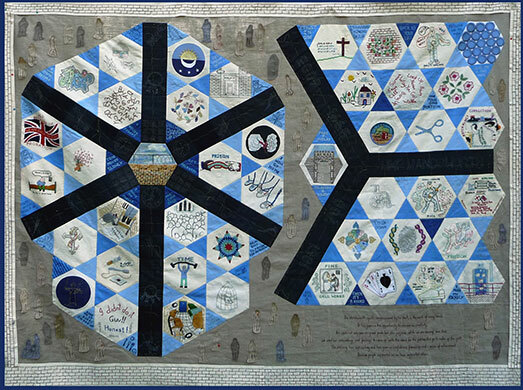 I remember seeing a quilt that Wandsworth prisoners had designed and made together for the V&A quilt exhibition and it was incredibly moving – some patches where upsets, some laugh-out-loud funny. It stopped everyone in their tracks and made us all think about the prison system, how we see prisoners and how we stereotype craftspeople. As the collective we volunteer a lot making kits for the prisoners to use (especially at Christmas when they are locked up in their cells for longer periods of time). I was in a documentary (Stitched Stories) with an ex-prisoner who works with Fine Cell Work and I love what he creates and his honesty about the benefits craft brought him in prison (a way to express himself, feel valued and skilled & time to reflect and exercise his inner monolgue). What you love about craftivism? Too many things to mention! It’s a tool for makers to think deeply about a particular issue and what they can do personally to fight for a better world and be the change they wish to see, which often fast forms of activism don’t offer. For the viewer whether they recieve a craftivism piece as a gift or see it as street art the piece provokes thought and discussion about whatever message is stitched and that the craftsperson has but time and thought into that piece and that issue. I’ve spent the last 5 years working for International Development charities as a campaigner and it’s interesting to compare the different forms of activism and how it engages politicians and other influencial people. Craftivism is a rare tool that engages politicians in a very different way to petition cards- I think there is a real value in having craftivism as part of the activism toolkit to build up relationships with your MP and encourage and support them to do the right thing and think holistically about how they can be the change they wish to see in the world even when it’s very difficult. Personally craftivism has also made activism sustainable for me and I really feel like I’ll always be a craftivist. Why did you decide to get involved in this Save The Children Campaign ‘Race Against Hunger‘? We are at a critical time when we could actually make an enormous difference to people’s lives across the world by showing our Government and the world that the UK public will not stand for a world that has enough food for everyone but still 1 in 7 people go to bed hungry even after a long days work. Save the Children have been successful in their campaigns in the past such as successsfully getting David Cameron to chair a Hunger Summit this year after the Olympics and they have ambitious targets to put hunger at the top of the agenda of the G8 next year which I believe they can reach with our help. Knowing that Save the Children have some of the best policy thinkers in the world and a team of campaigning staff working above and beyond to help the UK public mobilise and campaign, I want to support this campaign and believe that we can be part of this historic moment- I don’t ever want to think ‘what if’. What are you going to write on your three pieces and why? For the installation I’ve embroidered: “We are like pieces in a jigsaw puzzle; we are all unique and have our own special place in the puzzle of the universe.” because often we forget that our uniqueness can help fulfil the worlds potential and we have power and a duty to do so. I decided to stitch this quote for me to keep because I often get overwhelmed watching the awful things happening on the 10 o’clock news and feel completely disempowered. This is a great quote to remind me to do what I can and it does make a different even if we don’t always see it: “I alone cannot change the world, but I can cast a stone across the waters to create many ripples”. For my MP Jane Ellison I’m going to cross-stitch: “It is not only for what we do that we are held responsible, but also for what we do not do.” In the UK our MPs do actually have a hell of a lot of power and they are supposed to represent their constituents. I think this is a good balance of challenging her to do the right thing but also supporting her to do it when it can be difficult if her political party is against it. What other things are you doing for the project? Well I’ll be supporting craftivists across the UK get involved either on their own or in groups to take part. We’ve already made an instruction video, instruction sheets and examples for people to see but I’m here if people need extra help too. I’ll be helping to set up Craftivist Jigsaw events across the UK (see our events page for more detail) and just trying to share this project with the lovely craft community and support them where they need it.